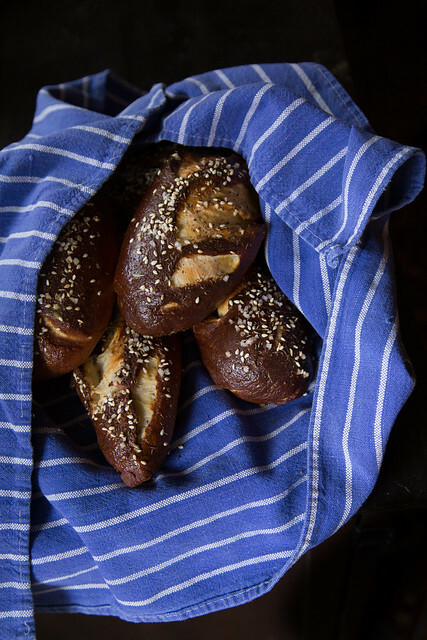 I had a great idea: Why don’t I make pretzel buns and top them with our Everything Blend?!! And you know what? I couldn’t find it, but I did find some Za’atar and I’m glad I did because Everything woulda been great but the Za’atar played so well with the brussels sprout slaw and the Wishbone Heritage Farms dogs we got at the market that day. In a small saucepan, heat butter until melted. Add milk and heat until warm but not hot. In a large bowl (or in the bowl of your stand mixer) combine milk mixture with yeast and brown sugar. Add salt and two cups of flour and mix until combined. Gradually add the rest of the flour, mixing until a smooth dough is formed. If using your stand mixer knead dough with the dough hook or knead by hand until a smooth elastic dough forms ~ about 10 to 12 minutes. Grease a large bowl with a little olive oil. Throw your dough into this bowl, cover with a damp tea towel and let rise until doubled in size ~ about an hour. Preheat oven to 400 F line a baking sheet with parchment paper. In a large pot combine H2O and baking soda and bring to a boil. Punch down your dough and divide into 8 parts (look at the size of your dogs, I made 7 buns because I wanted them to be longer). Roll each part into a log shape. Boil for 2 minutes, flipping them over if they stay on one side. Remove with a slotted spatula and place on parchment paper-lined baking sheet. 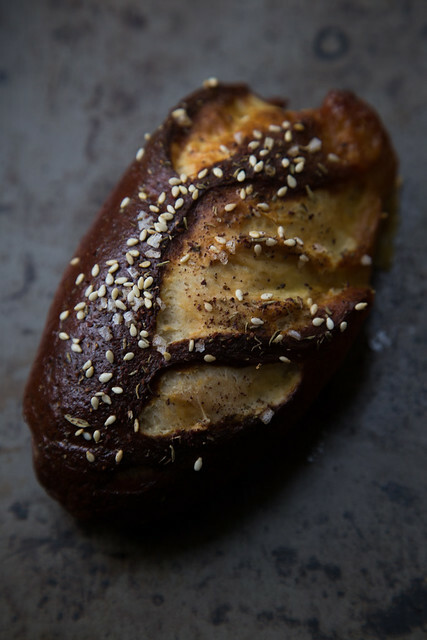 Brush with egg wash and sprinkle with topping (za’atar, everything, chunky salt…let your heart guide you). Bake 15 minutes, then lower heat to 350F ~ bake another 10 minutes or until the buns are evenly browned to your liking. 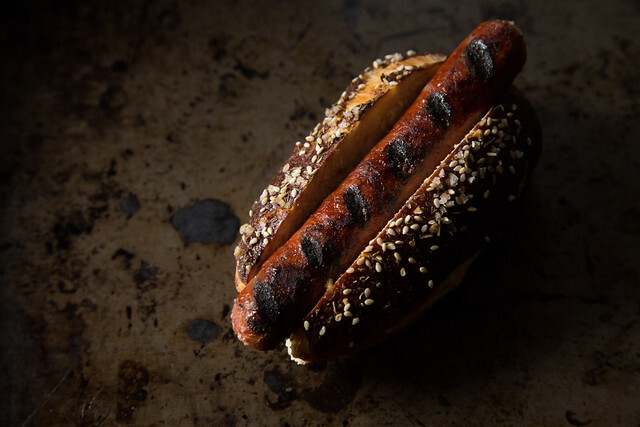 Serve with hot dogs and all the fixings (best the day they are made but still tasty one or two days later). 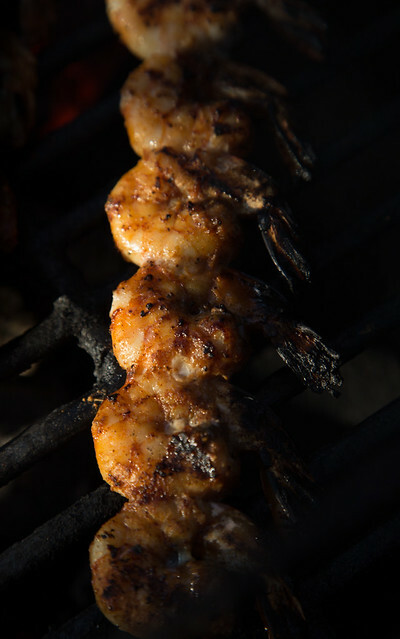 Harissa is one of our favorite shrimp seasonings! Spicy but with that sweet twang of coriander ~ the perfect pairing with pineapple jalapeno salsa and fresh guacamole! Combine Harissa, oil, and water in a small bowl. Toss with shrimp and let sit while the fire warms up and while you prepare the other components of your meal. Grilling isn’t necessary, of course, you can just pan sautee these bad boys! 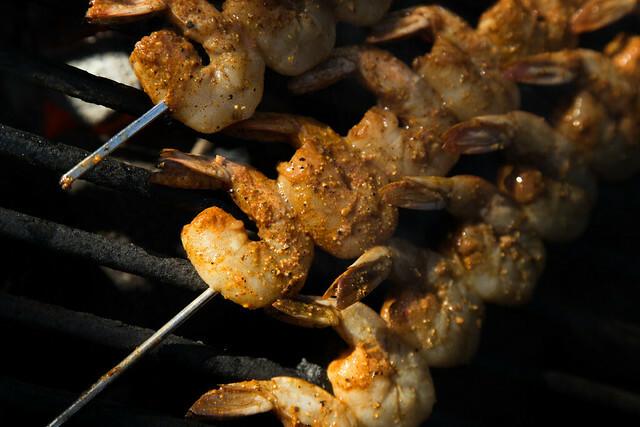 After 15 minutes throw the shrimp on the grill or into a pan and cook to perfection! And that’s that! Enjoy Harissa shrimp on hoagies, tacos, or tossed with fresh pasta! The smell of these beauties is truly delectable! The warmth of the spices combined with char of the grill is soooo good. Combine Ras, oil, and H20. Pour this mixture on your shrimp and cook however your heart desires! Grill ’em, pan sautee ’em, bake ’em on a pizza!!!!!!!!!!! Shichimi Togarashi is a lovely aromatic blend that is perfect for roasted veggies. Chop up your veggies of choice (I love potatoes, brussels sprouts, and carrots). Coat with olive oil and sprinkle liberally with shichimi! Roast in the oven at 350 for 20 minutes or until cooked to your liking! 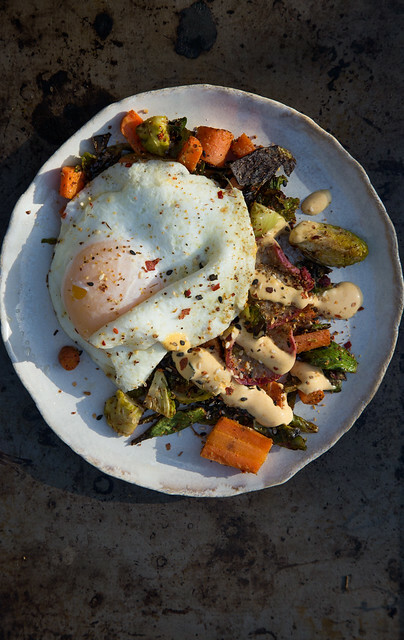 Enjoy immediately as a side dish or throw an egg on it and call it brunch!